July 28, 2013 - The U.S. Department of Transportation’s Federal Aviation Administration (FAA) is proposing a $2.75 million civil penalty against Boeing’s commercial airplanes unit for allegedly failing to maintain its quality control system in accordance with approved FAA procedures. In September 2008, Boeing discovered that it had been installing nonconforming fasteners on its model 777 airplanes. On October 2008, the FAA sent Boeing a letter of investigation that requested a response within 20 working days. 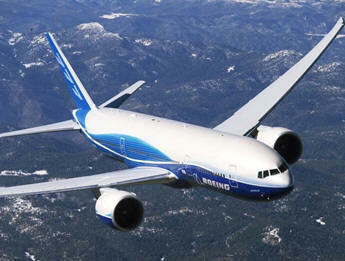 The Boeing 777 is a long-range wide-body twin-engine jet airliner. It is the world's largest twinjet and has a typical seating capacity for 314 to 451 passengers, with a range of 5,235 to 9,380 nautical miles, depending on the version. Commonly referred to as the "Triple Seven", its distinguishing features include the largest-diameter turbofan engines of any aircraft, six wheels on each main landing gear, a circular fuselage cross-section and a blade-shaped tail cone. Developed in consultation with eight major airlines, the 777 was designed to replace older wide-body airliners and bridge the capacity difference between the 767 and 747. As Boeing's first fly-by-wire airliner, it has computer-mediated controls, it is also the first entirely computer-designed commercial aircraft. The FAA alleges that Boeing repeatedly submitted action plans that set deadlines for the accomplishment of certain corrective actions, but subsequently failed to implement those plans. The company implemented a plan to address the fastener issue on Nov. 10, 2010, more than two years after Boeing first learned of the problem, “Manufacturers must make it a priority to identify and correct quality problems in a timely manner,” said FAA Administrator Michael Huerta. Boeing stopped using the nonconforming fasteners after officials discovered the problem. However, some of the underlying manufacturing issues continued to exist until after the corrective action plan was in place. Boeing has 30 days from the receipt of the FAA’s civil penalty letter to respond to the agency.